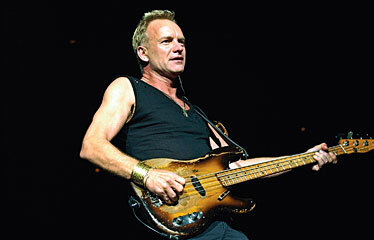 Lead singer Sting performed with legendary rock group the Police last night to a sold-out crowd at the Blaisdell Arena. A slide show from the concert, including commentary, will be posted at starbulletin.com and a full review will run in the Today section of tomorrow's paper. The group plays again at 7:30 tonight at Blaisdell Arena. Tickets are $74-$225; call (877) 750-4400 or visit ticketmaster.com. Children took off yesterday at the start of the Keiki Great Aloha Fun Run, an around-the-block event that began and ended in front of the Blaisdell Exhibition Hall. About 2,000 runners and walkers were expected to participate in the run, part of the Great Aloha Run Sports, Health and Fitness Expo being held this weekend at the exhibition hall. 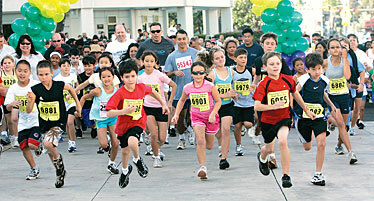 For more on Great Aloha Run festivities, please see Page A20. 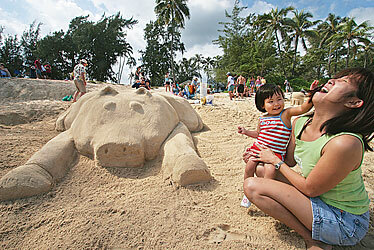 University of Hawaii at Manoa School of Architecture students and faculty took part yesterday in the 31st Annual Great Hawaiian Sandcastle Event at Kailua Beach Park. Aine Kendro and her daughter, Madison, had fun near a sculpture of a flying pig. In keeping with the theme "If Architects Ruled the World," the piece's theme was, "If architects ruled the world, then pigs would fly."